Egg Cleanser is an all natural, chlorine free, cleaner. It effectively removes manure and dirt from your eggs. 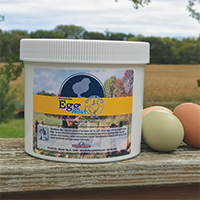 Murray's Best Egg Wash is a concentrated powder that safely cleans both market eggs and fresh eggs, taking the worry out of having unwanted bacteria on your eggs. Tired of washing all those eggs? This unit washes approximately 8 dozen eggs in a maximum of 15 minutes.